Coral Princess blends the exotic (an international staff, elegant Italian restaurant, celebrity-style spa treatments) and the familiar (cruising's ubiquitous buffets, poolside umbrella drinks and, yes, bingo). The ship is a vacation destination that offers up a pleasing amount of glitz yet makes passengers feel right at home. The 91,627-ton ship, built just trim enough to traverse the Panama Canal, accommodates 1,970 passengers and 900 crewmembers. On our 10-day trip -- from Fort Lauderdale through the Caribbean to Panama and back -- the ship was fully booked. But remarkably, there was a surprising sense of spaciousness onboard, a function of both design and operational efficiency. Decks 6 and 7, Fiesta and Promenade, are dedicated exclusively to lounges, entertainment venues, main and alternative dining restaurants, boutiques, an art gallery, cigar bar and a wedding chapel. In other words, public space. On many ships, there's a cramped feeling because such space often bumps up against a line of staterooms, making walking through tight corridors somewhat of an ordeal. Not so here. And nowhere is that feeling of openness grander than on the top deck, which has two outdoor shuffleboard courts, child-size chess pieces along with a gameboard and a netted basketball court. Truly, you feel on top of the world. To ensure the ship has staying power, Princess gave the ship an enormous makeover in November 2009. Coral Princess came out of dry dock with the line's signature Movies Under the Stars screen on its Lido Deck -- a delightfully attractive, adults-only, two-deck Sanctuary -- and flat-screen television sets in staterooms. New soft goods, carpeting in coral and turquoise hues, draperies and bedding were also added. 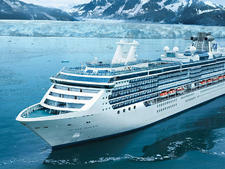 Introduced in 2003, Coral Princess -- along with sister vessel Island Princess -- is an aberration for Princess Cruises. The line only launched two ships this size before joining the rest of the cruise industry in building ever-more-massive ships -- like those in the Grand class. Not part of either the group of biggest-in-fleet vessels or the mid-sized Sun class of ships, Coral Princess falls somewhere in between. And in many ways, it represents the best of both. Size-wise, it falls just within Panamax boundaries, which means Coral Princess can travel through the canal, enjoying an itinerary flexibility not possible with the bigger ships. It also features more "personal choice" amenities and services than would, say, the Sun class of ships. An interesting tidbit: The 77,000-ton Sun Princess carries 1,950 passengers. Coral Princess measures nearly 92,000 tons and carries just 20 people more. As for operational efficiency, Coral Princess is a logistical showpiece. At our final disembarkation, it took just 10 minutes from the time our group was paged to exit the ship for us to collect our baggage, pass through the U.S. Customs and Immigration checkpoint, walk around the port terminal, and pop into a taxicab. Now that's a thing of beauty -- and it was that kind of crispness that defined our entire voyage. Our band of travelers, friends and family ranging in age from 2 to 79, found just about everything about Coral Princess to our liking. Sure, there were garden-variety complaints: a table reservation mix-up, Internet access cards that went on the fritz, a couple of room service misadventures and dramatically uneven room temperatures throughout parts of the ship. In the end though, none of it really mattered. The proof? By the time we had all departed for home, we had already planned our next trip … on Coral Princess in Alaska. Coral Princess' mainly Caribbean cruises tend to draw largely American passengers with a respectable showing of folks from Canada and the United Kingdom. It's also a noticeably older crowd. Well over half of the passengers on our cruise were 60-plus, with fewer than 230 passengers between the ages of 21 and 50. During summers and holiday periods, the number of children aboard does increase notably. Cruise Critic’s professional photographers and our extraordinary community members have taken 1,611 pictures of Coral Princess. When you visit our photo galleries, you can be assured that what you see is what you get. There are two formal nights on a 10-day cruise, and people dress to the nines on those evenings. Otherwise, dress is so-called "smart casual," which translates into something you might wear to a cocktail party or nice restaurant: A silky top and pants, a skirt and pretty sweater set or a comfy sun dress for the ladies and nice slacks and a shirt (no tie or jacket required) for the men. No jeans or shorts are permitted in the dining rooms, though. Gratuities, which are automatically charged to onboard accounts, are $12.95 per person (including children), per day, for passengers staying in standard accommodations and $13.95 for passengers staying in mini-suites and suites. A 15 percent gratuity is added to beverage purchases onboard, including wine at dinner. Spa and casino staff members don't share in the gratuity charges (if you use these services, tips are advised).